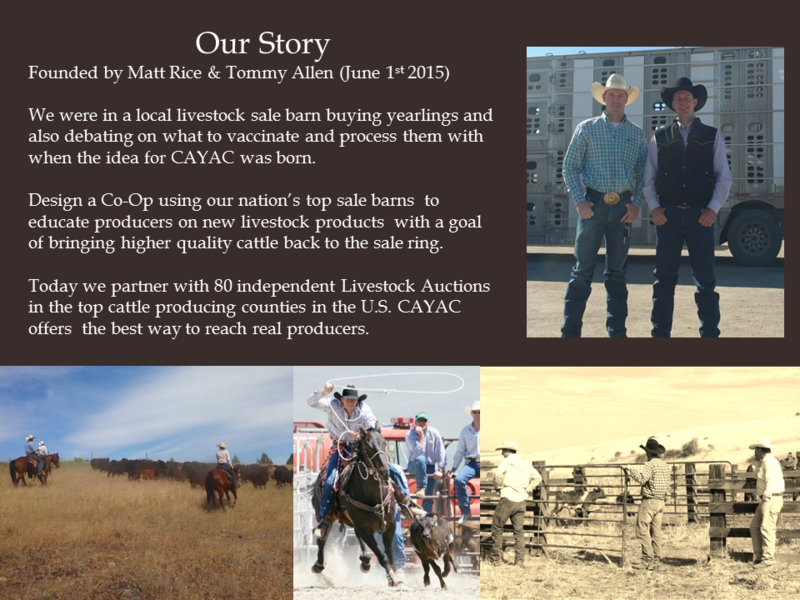 CAYAC is the brainchild of two millennial cowboys; Matt Rice and Tommy Allen. Both have a background in livestock, from managing cow-calf operations to stocker cattle. Their cattle knowledge in combination with work experience at Allen Media, (The Ag information Radio Network of the West) has given them a unique understanding of the value of targeting a message directly to the right audience. The average CAYAC Sale Barn moves over $1,000,000 in cattle each week, providing your brand/product premiere exposure to those who just invested $1,000,000 to improve their herd and, also those who pocketed $1,000,000. CAYAC is the perfect opportunity to reach REAL producers. Give us a call and we can log you into our CAYAC Agency Planning Tool so you can assess which option is best for your marketing communication needs: HD Digital Monitor, Sale Ring Door Banners, or Bid Cards. The CAYAC Agency Planning Tool provides you with the advertising geography coverage information, rates, and total annual cattle numbers.